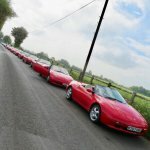 Lotus Elan Central • View topic - Are these going to fit my car ? Are these going to fit my car ? With my head soon to be replaced things are obviously coming off so i want to do as much as possible whilst i'm there. Are these two items correct for my car ? Will they all fit together nicely ?! Bit confused as the pre cat elinmiator says suitable for 2 1/4 inch systems. The down pipe says its made from 2 1/2 bore ? Which comes first the pre cat elinmiator or downpipe ?! I have the Piper 2 1/4 system with sports cat fitted. Re: Are these going to fit my car ? You don't need both of these - it's one or the other! It becomes a bit clearer if you consider the time-line history (which is easy for me to say, 'cos I was involved in it from the start, but not necessarily so clear to anyone who hasn't been here for 10 years or so, so it is no disrespect intended to yourself). ...and so it goes on. What I would say is that if you currently have a 2 1/4" piper system, a PCE will give you an improvement (as would the whole downpipe), but they would both give a very similar improvement - but if you have a 2 1/2" system, the downpipe will give more improvement to a PCE. Whichever way you decide to go, make sure that you have plenty of spare change for the swearbox - getting all the bolts which hold the PCE to the topbox out can be "fun". I literally fitted the downpipe yesterday - I can heartily recommend it! It's a little louder but the car spools more quickly. It's also massively lighter and easier to fit. Piper claim it will only work with their exhaust but it happily bolts up to the cybox/peco. You do lose all the heat shields but with the current temperatures what does it matter! Thanks Dave - thought i was getting unnecessarily confused! ! So, (hopefully) what you are saying is you either buy the PCE which bolts onto the existing downpipe, or buy the new improved downpipe which replaces both ? Sounds great. Is this on the SE? I've got a S2 and I've been told if the pre-cat is removed then the car will not pass the MOT emissions test. I've got a PNM exhaust... so no main cat (box) on the system. Can an S2 pass the MOT without any cat on it then? It is on an S2 yes. I thought being over 20 years old the pre cat would be pretty much useless anyway ? I've got a sports cat in the main part of the exhaust. The pre cat is to comply with the law rather than the MoT test. When the engine is cold the main cat hasn't warmed up to its "light off " temperature and isn't effective. The pre cat being close to the manifold heats up faster and compensates. With the engine hot and the main cat working you should pass the MoT test. Tested to the correct standard with a strict tester. The sports cat is marginal. You may need a warm up drive if the car has been idling. If you remove the pre cat you may pass the MoT but may not comply to laws regarding construction and use. simonbuk wrote: Thanks Dave - thought i was getting unnecessarily confused! ! The PCE replaces item number 53.
ok great, understand now thanks. And Piper got back to me confirming i could purchase just the PCE without the cat, its just their website that doesn't allow it !! Did anyone ever tried to add a helmholz resonaor to a PECO exhaust in order to get rid of the drone noise? Well the PCE eliminator has been fitted and failed it's MOT. It's half a per cent out in emissions. I 'believe' I have a sports cat in my exhaust but unsure what it is exactly. I need to know what it is exactly before I proceed, my MOT man thought it was just a silencer. If he knows it's a cat in there he will try some other things to get it to pass. Sounds like I might have f*cked up and need to put the pre-cat back in place !! simonbuk wrote: Well the PCE eliminator has been fitted and failed it's MOT. It's half a per cent out in emissions. I 'believe' I have a sports cat in my exhaust but unsure what it is exactly. The first few years cat-less my car past MOT, but ony just. Then suddenly there was a change (what? Vacuum leak?) and the CO increased 0.5, MOT fail. Then i found a loophole in the regulations. Due to the loophole my car is allowed to be measured to open loop standard, so 2,5% CO2. They unplug the O2 sensor and presto! pas with flying colours. Can you stick a camera in that thing? Looks more like a Cat then a silencer to me. Perhaps it was a cat once but it's emptied? Simon, my car has one of those and I have a Piper with sports cat. Kathryn wrote: Simon, my car has one of those and I have a Piper with sports cat. So is that the sports cat ?! Just trying to clarify exactly what it is. Had it confirmed from Piper that it is indeed the sports cat. Can you post the emissions results? How old is the fuel? Is it cheap stuff or high octane? Brand? How hot was the engine fans coming on? Did you drive it hard before the test to get it hot? Haven't got the results I'm afraid. My MOT man says its either half a per cent too high or currently at half a per cent (can't remember which ! ), and needs to get it down to 0.33. sound right ? He said he let it get nice and hot so the fans were coming in. Had standard fuel in it when I left it end of Feb. He said he's got some chemicals he can add to see if that helps. CO should be max 0.5 at idle and 0.3 at 2500 rpm. If it is 0.5 and it should be 0.3 you are miles out. If its 0.33 and needs to be at 0.3 a spirited drive before testing would probably do it - The cat needs to be hot and the oil needs to be at 80°C for the test which they might not be if the car has been idling for a while. You asked about the type of petrol being used, would that make much of a difference is I put some expensive stuff in ?